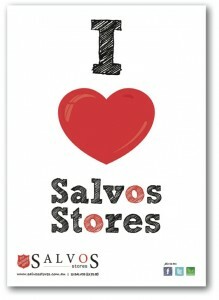 In August, Salvos Stores launched the ‘I Love Salvos Stores’ campaign. The campaign promoted the many reasons why people love shopping at Salvos Stores, such as the wide range of goods, bargain prices, numerous outlets, helping those in need and shopping sustainably. 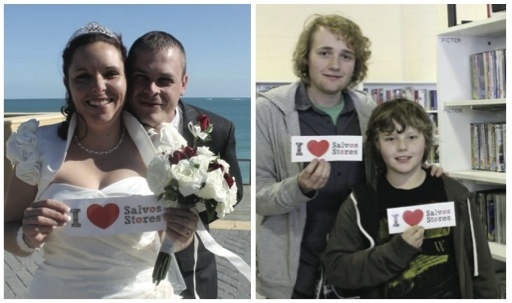 In addition, the campaign asked customers to identify why they love Salvos Stores. The campaign was primarily focused on encouraging current Salvos Stores shoppers into stores. It also aimed to appeal to people who may not have shopped at Salvos Stores before through a new message and media. As well as encouraging people to shop in-stores, Salvos Stores always has the challenge of keeping the brand top of mind, to ensure a consistent stream of donations continue to flow throughout all stores. Salvos Stores relies on the continued volume of donations from the general public to run successfully. to highlight and reinforce Salvos Stores’ commitment to the environment through the link with the ‘Buy Nothing New Month’ campaign and launch of sustainability logo. Twitter to support the Facebook campaigns. The Austereo network was chosen across the three main cities where Salvos Stores are spread. This included FoxFM in Melbourne, SAFM in Adelaide and 92.9FM in Perth. TerritoryFM was used in the Northern Territory. There were more than 1400 spots aired over the three stations, with a mixture of five, 15 and 30 second advertisements. Salvos Stores also received content on the Austereo websites. A 30-second television commercial was put together using stock images. The images showed people the different objects people can buy from Salvos Stores. The commercial was shown in regional areas which weren’t covered by the radio. 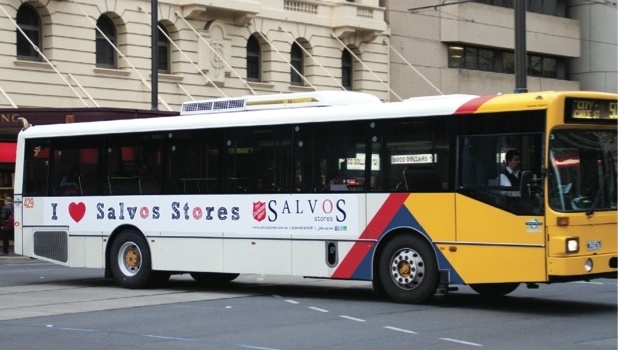 Salvos Stores used outdoor media as a way to advertise to people working in the three major cities. Salvos Stores had a number of ‘24 footer’ advertisements and interior posters on trams and buses. The panels were effective in communicating the simple message in the time people had to read them, with 2.6 million total contacts across Melbourne, Adelaide and Perth with an average frequency of 2.0. The in-store element of the campaign was impossible to ignore by Salvos Stores customers and street traffic. Eye catching A1 posters in the windows were visible from the street. Each staff member and volunteer wore an ‘I Love Salvos Stores’ badge throughout the duration of the campaign. Customers were also able to help themselves to ‘I Love Salvos Stores’ bumper stickers and flyers when they were shopping in store. The flyer introduced customer to the Salvos Stores sustainability logo. Now, the logo appears on all marketing materials to remind people of Salvos Stores commitment to the environment. The social media element of the campaign was vital to the campaign success and engaging the younger customer. Through the Salvos Stores Facebook and Twitter pages, fans and followers were asked to say why they love Salvos Stores for their chance to win a $100 Salvos Stores shopping voucher. Alternatively, they could pick up an ‘I Love Salvos Stores’ bumper sticker in store, and post a photo of it on the social media pages. In phase two of the campaign, photos of outfits put together from clothing sourced at Salvos Stores were posted on the Facebook pages. Fans had to say where they would wear the outfit for their chance to win it. The competition was supported by paid Facebook advertising. There was a significant jump in sales when the campaign started. These statistics prove the campaign’s overall success. Between August and November, sales were up 2.93% on the earlier months of the year. Sales were up 6.6% on the same time last year. Sales peaked and remained at a consistently high level while the ‘I Love Salvos Stores’ campaign was running. There was positive feedback from shoppers on the in-store artwork, as well as the social media, radio and television campaigns. During 2011, Salvos Stores Facebook ‘likes’ increased by 2892, post views increased by 606% and post feedback increased by 423%. The unique daily users and level of interactions increased and became much more consistent. In 2011, Salvos Stores started its Twitter profile, the majority of this increase can be directly accredited to the ‘I Love Salvos Stores’ campaign. At the end of 2011, the Twitter page had 540 followers. These results are invaluable for Salvos Stores, because those fans and followers continue to support Salvos Stores well after the campaign is over. Salvos Stores fans now expect prompt responses to their online queries and feedback. The ‘I Love Salvos Stores’ campaign achieved great success through increased sales and donations across five states. The campaign boosted brand awareness through the use of a variety of advertising mediums. ‘I Love Salvos Stores’ social media competition ensured there was a high level of interactions on the Facebook and Twitter pages.